Humans are a problem-solving species. We uncover challenges—How do we get food? How do we make shelter? How do we stay healthy?—and then we develop tools to solve those problems. Permaculture is one of those tools. For the last 10,000 years, agriculture and the civilization it built have been the way humans attacked the problems of meeting basic needs. Because we live on a planet that for millennia was large compared to the human population and its needs and impact, our species could focus on expanding and improving agriculture’s immense power to convert wild ecosystems into food and habitat for people, and we could ignore ecosystem health. But our industrial civilization of seven billion is chewing up ecosystems relentlessly. We are learning that without healthy ecosystems, humans—and everything else—suffer. 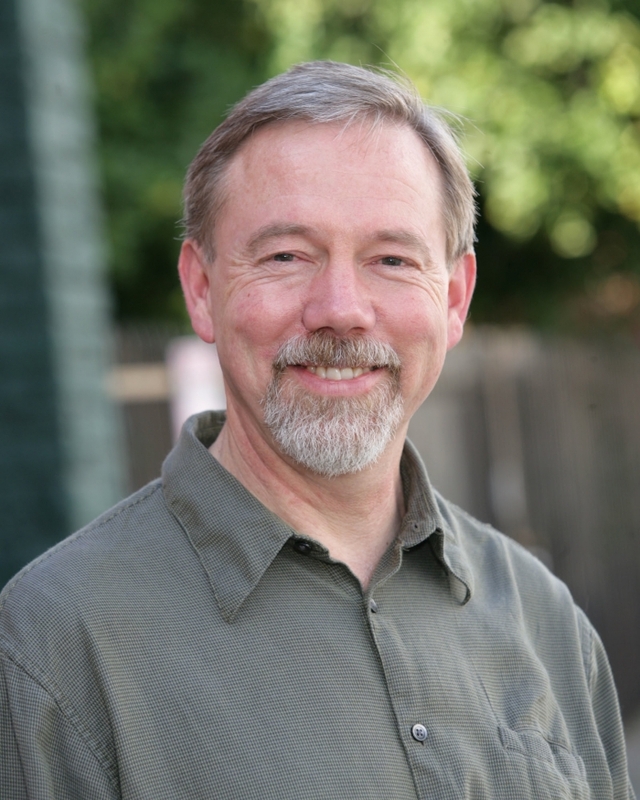 So we cannot focus solely on the problem, “How do we meet human needs?” but must now add the words, “while preserving ecosystem health.” Rafter Ferguson has offered that question as a definition of permaculture. He’s onto something, though I think that “meeting human needs while preserving and increasing ecosystem health” is the goal of permaculture, and not its definition. But it gives some clues toward defining it, and helps untangle the knots wrapped around “What is permaculture?” It names and clarifies the problem that permaculture is trying to solve. Thomas Kuhn, in his masterwork, The Structure of Scientific Revolutions, uses the word “paradigm” to mean the viewpoint that defines the problems to be solved in a particular field. Kuhn explains that the proper framing of a paradigm reduces the number of blind alleys that researchers go down by re-stating a problem in clearer terms. New paradigms usually require—and spur the development of—new tools to solve the now-reframed problem. “Paradigm” has been trivialized through overuse and I’m sure that Kuhn is spinning in his grave. But I don’t think it’s abusing the term to view the change in humanity’s principal goal from “meeting human needs” to “meeting human needs while preserving ecosystem health” as a paradigm shift. It changes the tools that we use, and the mindset required to develop and use new, appropriate tools. It restores a relationship between people and nature that agriculture, by treating nature as a mere resource to be subjugated and consumed, had severed. Suddenly, agriculture and industrial society look like scourges and technologies of destruction, rather than the saviors of humanity that we’ve regarded them. That’s quite a shift. Permaculture and other ecological approaches are attempts to articulate this new paradigm, by framing the problem and offering tools and strategies to pursue its solution. When the larger problem is framed so that it reveals the interdependent relationship between human needs and ecosystem health, we can more clearly see the steps to the solution. Now we can ask, what are human needs, and how can each of them be met while retaining, restoring, and improving ecosystem health? We know how to articulate human needs, and we have metrics to gauge ecosystem health. Our problem now is to reach this twinned goal, and permaculture offers us hope. So, why, then, is permaculture so confusing to define? I think it is because in the early days of any new paradigm, the boundary between the new paradigm and the tools—mental and physical—needed to articulate and solve it is blurry. We’re confusing the mindset required to do permaculture effectively with the work of doing it. Let me give a historical example to show what I mean. In the 18th Century, the ability of certain things to burn was attributed to something called phlogiston. Matter was thought to be made of elements plus principles, and phlogiston was the principle of combustibility. When an element burned, it released phlogiston, and burning stopped when all was released. The residue contained the principle of calx, the true elemental substance. The theory was backed by the fact that many things, such as wood and other fuels, lose weight when they burn. In the 1770s, cracks began to appear in phlogiston theory. Antoine Lavoisier, using careful experiments and new, accurate balances, found that many substances gained—not lost—weight when they burned. In 1771, Carl Scheele, and later Joseph Priestley and others, produced samples of a gas (the yet-unnamed oxygen) that made flames burn more brightly and longer. They called this “dephlogistonated air,” since, to fit into the theory, it had to be able to accept more phlogiston from burning substances than air could. This sort of stop-gap, convoluted reasoning is one of the first signs that a theory is failing. By 1777, Lavoisier was sure this gas was a pure element that combined with others to support burning, and began to reject phlogiston theory. Priestley and others objected; the were simply not able to recognize oxygen for what it was. They knew that elements contained principles, like phlogiston and calx, and believed that these principles could combine with elements, were hidden or revealed through processes such as burning, and could be found unchanged after those processes. The idea that a substance could chemically bond with another and be transformed did not fit their paradigm of matter. It was, literally, inconceivable. But phlogiston theory was doomed by the piling up of inconvenient facts, and by 1800, what is now called the chemical revolution had swept it away. The rejection of phlogiston and the acceptance of the chemical revolution was logically simple—the oxygen theory of combustion snuffed out the contradictions of phlogiston—but it was cognitively difficult because of the mental barrier created by phlogiston thinking. It took a revolution in thought to see oxygen. Many of the pioneers of this revolution called themselves natural philosophers, and they led an enormous shift in worldview that required and prompted a new way of thinking about nearly every natural phenomena and event. From the 1500s to the early 1800s, the new astronomers, chemists, and physicists were seen as radicals and a threat to the social order. They often were: Thomas Jefferson, Benjamin Franklin, and other revolutionaries were promoters of this new scientific approach based on measurement and experiment. The philosophy that guided their work was, at that time, hard to distinguish from their work itself. Nowadays we view chemistry and the other sciences bred during this tumultuous era as settled disciplines that are neatly split from politics and philosophy, but in those days, to practice chemistry or astronomy was part of a radically new worldview, and the boundaries between the scientists’ radical philosophy, the problems that it set for them to work on, and their experimental approach to those problems were not distinct. Permaculture, like phlogiston-cramped chemistry, can’t be understood well under the old paradigm, and I think this is why it is often regarded as a movement and philosophy as well as a problem-solving approach. To grasp permaculture fully, we need to have made the shift to the new paradigm. New tools and new paradigms mutually reinforce and strengthen one another, and permaculture is one of many examples of this. Lavoisier’s improved balances exposed inconsistencies that toppled phlogiston theory from its perch, and demanded a new way of thinking about gases and matter. In a similar vein, permaculture’s design methods such as zones, sectors, and needs-and-yields, by emphasizing relationships and consequences, reveal the weaknesses of thinking in terms of isolated events and static objects. The flaws in old-paradigm concepts like infinite growth, waste, and “externalities” become glaringly obvious under a whole-systems view. The tools encourage the new thinking, and the new paradigm helps create the appropriate tools. Many people come to permaculture knowing that there is something wrong with the old worldview, but they don’t yet have a new paradigm to replace it. They are attracted to permaculture as better gardening or as a means of social change, and gradually adopt the new worldview as they see it overcoming the flaws and damage of the old. Others come to permaculture after shifting to this holistic paradigm because permaculture supports it and offers an approach to working within it. In both cases, it takes time to fully grasp the depth of permaculture in part because nearly all of us were raised in the old paradigm. After twenty years of practicing permaculture design, I still have trouble defining it. Permaculture, then, is not a philosophy or worldview, and it is not a single tool, either. But to use permaculture well requires adopting a new worldview and new tools. Just as it was for the early chemists who called themselves philosophers, for permaculturists the boundary between the tools, the approach to using them, and the worldview that makes their effective use possible are blurry. In some ways permaculture is in a class similar to the problem-solving approach called the scientific method, the experimentalist strategy developed by Lavoisier, Boyle, and their peers. You can’t rightly call either of them a paradigm or a particular set the tools. They each are the approach for using a wide array of tools—a way of working that is guided by the paradigm. So of course this is confusing. People have been arguing over what “the scientific method” is for centuries: is it deductive or inductive, does the hypothesis or the data come first? Most scientists can’t tell you. They learn the scientific method by using it, and even when you know how to use it, it’s devilishly hard to explain what it is. Sound familiar? With all this in mind, I think the definition of permaculture that must rise to the top is that it is a design approach to arrive at solutions, just as the scientific method is an experimental approach. In more concrete terms, permaculture tells how to choose from a dauntingly large toolkit—all the human technologies and strategies for living—to solve the new problem of sustainability. It is an instruction manual for solving the challenges laid out by the new paradigm of meeting human needs while enhancing ecosystem health. The relationship explicitly spelled out in that view, which connects humans to the larger, dynamic environment, forces us to think in relational terms, which is a key element of permaculture. The two sides of the relationship are explicitly named in two permaculture ethics: care for the Earth, and care for people. And knowing we need both sides of that relationship is immensely helpful in identifying the problems we need to solve. First, what are human needs? The version of the permaculture flower that I work with names some important ones: food, shelter, water, waste recycling, energy, community, health, spiritual fulfillment, justice, and livelihood. The task set out by permaculture, in the new paradigm, is to meet those needs while preserving ecosystem health, and we have metrics for assessing the latter. The way those needs are met will vary by place and culture, but the metrics of ecosystem health can be applied fairly universally. This clarifies the task set by permaculture, and I think it also distinguishes permaculture from the philosophy—the paradigm—required to use it effectively and helps us understand why permaculture is often called a movement. Permaculturists make common cause with all the other millions of people who are shifting to the new paradigm, and it is that shift—not the design approach of permaculture that supports it—that is worthy of being called a movement. Permaculture is one approach used by this movement to solve the problems identified by the new paradigm. To do this, it operates on the level of strategies rather than techniques, but that is a subject for another essay. Because we are, in a way, still in the phlogiston era of our ecological awareness, we don’t know how to categorize permaculture, and we can confuse it with the paradigm that it helps us explore. Permaculture is not the movement of sustainability and it is not the philosophy behind it; it is the problem-solving approach the movement and the philosophy can use to meet their goals and design a world in which human needs are met while enhancing the health of this miraculous planet that supports us. 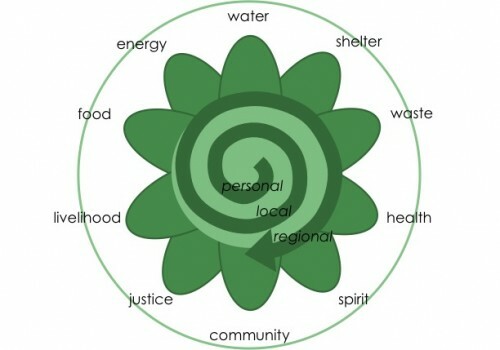 The Permaculture Flower, modified from Holmgren. The petals represent the basic human needs, and we work to meet them sustainably on the personal, local, and regional levels. 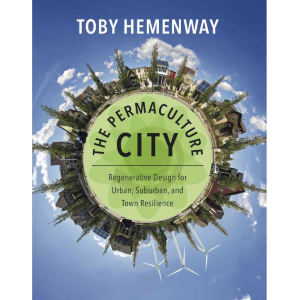 The only formal writeup of permaculture strategies that I know of, if I can blow my own horn, is in my new book, The Permaculture City. There are many lists of permaculture principles, and loads of techniques in other sources–any permaculture book and many websites. But descriptions of strategies are rare. when you refer to the “scientific method, the experimentalist view” would you be able to refer me to a resource that delves deeper into this? I am trying to reconcile my own worldview with permaculture and I think it would be helpful to understand better where you think permaculture might have its origins. See Thomas Kuhn’s “The Structure of Scientific Revolutions,” and Karl Popper’s “The Logic of Scientific Discovery.” The former is not that tough a read (the latter is a long and deep book, but brilliant). Reading, say, Wikipedia’s synopsis of them will ease you into them. Another, shorter piece that really exemplifies permacultural thinking is Donella Meadows’s “Places to Intervene in a System.” Free as a pdf, and a great intro to whole systems thinking, which permaculture is a good example of. I’ll think up more when I have time. How we got away from a holistic worldview and how we can find our way back is one of my favorite topics. There’s much good stuff in David Abram’s “The Spell of the Sensuous” and Morris Berman’s “The Re-Enchantment of the World” that is also relevant. I’ll dig around my library and find a few more. Thanks for the ’30 most valuable plants’ download! I enjoyed your article. If I have understood correctly, you see permaculture as a method rather than a movement? Perhaps that is the way I interpret your words because of my own feelings. I think of permaculture as a design approach. It’s a movement, I suppose, only in the “small m” sense of being something that a lot of people are doing, like “the fixed gear bicycle movement.” But I don’t think of it as a capital M movement, like the Civil Rights Movement or the Anti-War Movement. Those movements enroll people through rallies and politics, not through courses and books, and they go away when their goal is reached. Permaculture doesn’t have that kind of goal, and it won’t go away like the anti-war movement did when the Vietnam war ended. So I think I see it the same way you do.